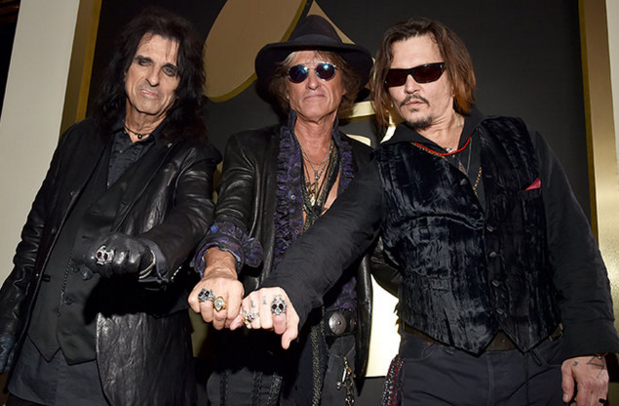 Hard rock fans received their moment of spotlight at the Grammy’s Monday evening from all-star super group “Hollywood Vampires“. During what is known as “music’s biggest night,” the Grammy’s dedicated a segment to salute a true legend of heavy metal — Motorhead‘s Lemmy Kilmister — who passed away on Dec. 28 at the age of 70. Grohl then introduced the all-star super band, Hollywood Vampires, who proceeded to pay their tribute to Lemmy. They opened with their new single “As Bad As I Am,” before progressing into Motorhead’s “Ace of Spades”. The camera pans over to an amp set up with Kilmister’s signature hats, basses and a jacket draped over the microphone. 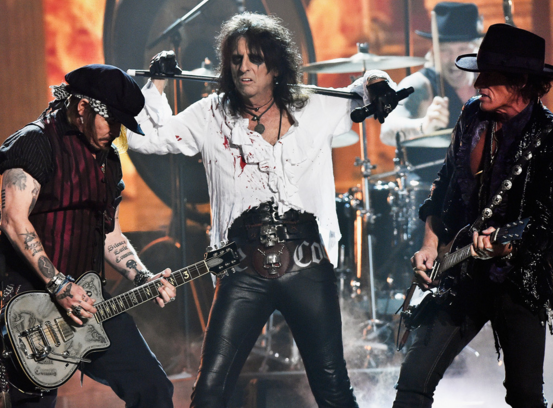 Alice Cooper delivers his signature vocal aggression, backed by bassist Duff McKagan, while the band, (which also features actor Johnny Depp and Joe Perry of Aerosmith), rocked out with plenty of pyrotechnics and metal presence. The group’s lineup also features Matt Sorum, Tommy Henriksen and Bruce Witkin. It should be noted that Sorum once manned the kit as a fill-in for Motorhead at one point in his career, as well as the likes of Guns-N-Roses, Velvet Revolver, The Cult and Slash’s Snakepit. For more on the band’s single “As Bad As I Am” it appears on the deluxe edition of the group’s self-titled album “Hollywood Vampires“. Alice Cooper recently described the track as inspired by a story told by Johnny Depp about his father, who was known for using the toast, “Good as you are, bad as I am.” Cooper dug the toast so much he felt it like it needed to be a lyric and the song escalated from there. Check out this snippet of the performance! Previous articleTWO WHEELED GIANT, NO LONGER KING? NOT ACCORDING TO SOME CELEBS!